Hey there! Just wanted to pop in and share a layout using the new Gossamer Blue October Kit. First, let me share a photo of the kit, in all of its glory. Seriously, how wonderful are these colors? I love Fall colors, and this kit is a perfect mixture of them. Now, for my layout....I used a photo of a dear friend's son. He was at the Pumpkin patch, and well, this photo is too sweet. And, yes. 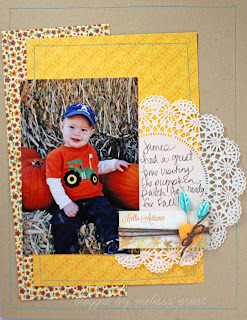 I DID add a doily on a boy layout. I do think it works perfect, and is the sweetest addition to this page. Totally unexpected (on a boy page) but oh, so perfect! For this page, I used a sketch from the ScrapFit Blog. This site has been around for awhile now, but it is fairly new to me. You should check them out, and play along with their challenges! I will be linking my page up to the sketch challenge, found here. Its been a long day today. Spent most of the day unpacking and washing clothes from last week. Alex and I took a road trip. No worries - I will post details and photos this week! Great page, kind of jealous about the kit, I've been loving their stuff, but budget is tight right now. Love the doily and the colored stitching! great layout! 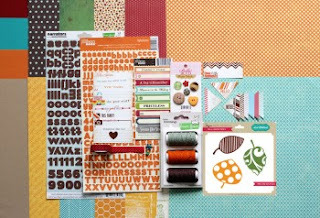 i've been hearing such good things about the gossamer blue kits...unfortunately i'm not even getting through my studio calico kits...maybe oneday soon! The kits are just lovely and I love your layout! The doily totally belongs there! I'm with Jessica though - I can't even get through my SC kits, so no Gossamer Blue for me yet but a girl can dream! Their kits look fantastic! Great page! Love that you journaled on the doily! Great idea! Love what you did with the sketch! Your LO is beautiful I love the journaling on the doily, thank you so much for working outwith us at ScrapFIT! Melissa I LOVE it thanks for visiting me over at ScrapFIT!